Reverse osmosis systems are used to reject bacteria, sugars, proteins, particles, dyes, and other constituents that have a molecular weight of greater than 150-250 daltons from tap and brackish water. It is also capable of purifying water and remove salts and other impurities. Our largest tap and brackish water units, the RO-500 series, comes standard with media pre-filters, chemical dosing, and antiscalant. These systems can be customized to fit individual customer and water application needs. The RO-500 series has a capacity of 200,000 to 900,000 GPD. Our largest tap and brackish water units, the RO-500 series, can come standard with media pre-filters, chemical dosing, and antiscalant. 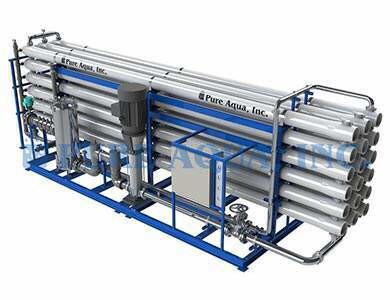 These systems are usually customized to fit individual customer and water application needs, and is considered to be one of the most compact industrial reverse osmosis systems in the market, it also features state of the art energy saving membranes. When we design the RO-500 series industrial reverse osmosis plants, we consider robust construction, user-friendly design, environmentally conservative operations, and long term reliability. Note: If the feed water TDS exceeds 1,000 ppm, the system model number changes to BW-XXXK-XXXX, and a suffix is added to the end of the model number: “-3” is added if the TDS is 3,000 ppm or less, and “-5” is added if the TDS is 5,000 ppm or less. Example: Required system to produce 320,000 GPD with a feed water TDS of 5,000 ppm, the corresponding model number is: “BW-320K-7680-5”.